A novelty at Tucson 2017. 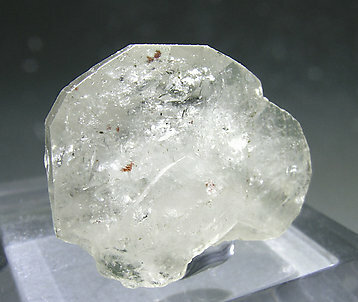 Doubly terminated and complete Phenakite crystal with a small feldspar (probably Albite) matrix. The crystal has the finely striated faces of a main prism, the smooth surfaces of a secondary prism, and the rough terminal rhombohedron. An excellent thumbnail of a species that is very uncommon at Afghanistan. From the most classic locality for the species. 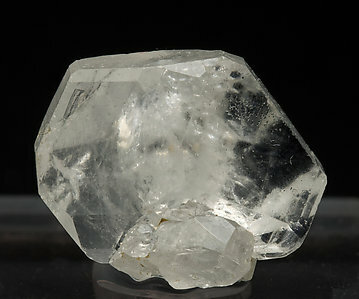 It is a typical flattened crystal with predominant rhombohedra very, very flattened forms as terminal faces and with poorly developed prism faces forming a very thin fillet around the crystal. 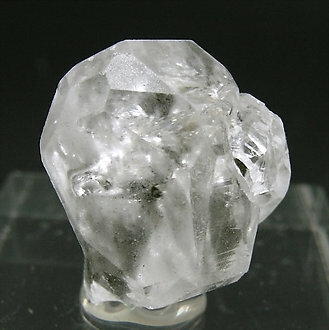 Small crystal with very well defined faces and edges. It is transparent and bright and it is from probably the most classical locality for the species. Group of crystals, one of them clearly dominant, formed by a very short prism and a very much flattened rhombohedron on the terminations. They are colorless, transparent and bright. From a Brazilian locality that is a classic for the species. A novelty at Munich 2012. 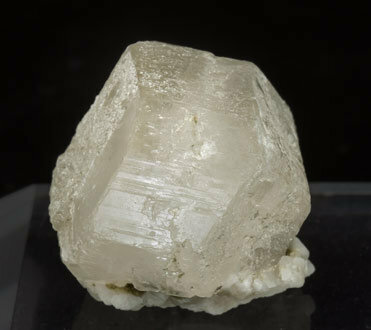 Phenakite is a new species for Huanggang, or at least it was not previously referenced, and we must add it to the already long list of species from this mine. The elongated Phenakite crystals that coat the entire sample are very small but show very well defined faces and edges. They are transparent and intensely bright. They are with sharp octahedral crystals of Fluorite with smaller faces of the cube. 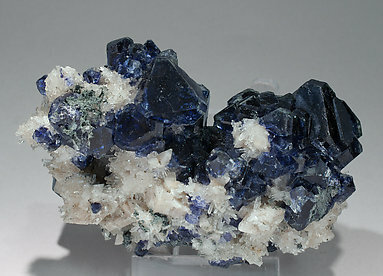 These crystals are translucent, with a very deep marine blue color and very well marked phantom growths. There are also some isolated crystals of Orthoclase (adularia variety). We’ll send a copy of the analysis of the Phenakite and the Orthoclase. 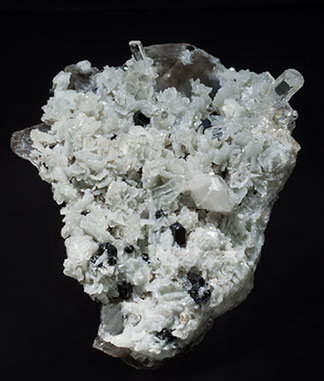 Two twinned, very sharp, colorless and completely clear Phenakite crystals, with perfect terminations, on an Albite matrix and with a small Schorl crystal. Very esthetic. 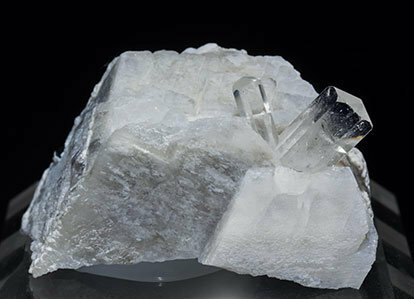 Twinned, very sharp, colorless and completely clear Phenakite crystals, with perfect terminations and on a smoky Quartz matrix coated by slightly blue Albite crystals and small Schorl crystals.